The Beckham family boat, sold to raise money needed to turn the garage into a family room. Its sale was a great sacrifice for the owner. There's a little book that has been on my desk for months, "Six-Word Memoirs on Love & Heartbreak," inspired by Ernest Hemingway's contention that a story can be told in half a dozen words (His famous line? "For Sale: baby shoes, never worn.") The book is full of six-word tales, some good: "I thought we had more time"; "I have never been in love." Some not so good: "I told you it affects me." "He sold his boat for me." These are my six words. He sold his boat and it was a lifetime ago, ancient history now. And it was a little boat. But it was a big act of love that I didn't recognize for a long, long time. Not until I wrote those words. For the boat was just a boat in my eyes. But in my husband's? He could tell you the horsepower and the color of the seats and how many people it held and how much he paid for it and how much he got for it - because it was his youth, his plumage, a speedboat that he hitched to the back of his shiny GTO. It turned heads. It made girls notice him. He was 19 and he liked that. He took it to New Hampshire sometimes but mostly to the lake in Sharon, where he took me now and then. He tried to teach me to water-ski. His other girlfriends skied. But I continually failed. 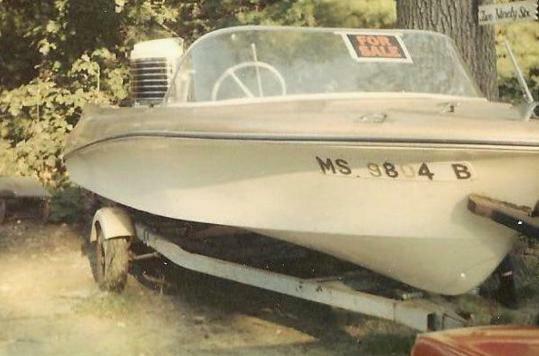 He sold the boat a few years later in the middle of a summer in order to get the money we needed to turn our garage into a family room. He was 24 and I was 23 and we had an 8-month-old whose bedroom had been our family room. I said, "We need more space." And he said, "I'll sell my boat." And that was that. He never moaned about giving up something he loved, and I never said, "Don't" or "Are you sure?" I called my uncle and asked if he'd help us build a room and he said OK, knowing full well that he'd be the one doing most of the building because my husband knew little about flooring and insulation, air ducts, and electrical work. My husband gave up his boat and picked up a hammer to please me. My uncle had five kids and a house of his own, but there he was every weekend, at my door at the crack of dawn. The things we give up and take on for the people we love. And then we forget. I had a case of the flu the week before I got married. My father went out and bought me a coat. He'd never bought me an item of clothing in his life; that was my mother's job. The coat was wool, emerald-green, and beautiful. "I want you to be warm," he said. I thanked him for that coat. I loved him for that coat. But it wasn't too long after that I forgot about the coat because I got annoyed with him about something he said or did or something he didn't do. And that something was all I could see. This is what happens. You get a coat or a guy sells his beloved boat for you. But time goes by and life goes on and there are arguments over dirty dishes in the sink, laundry that needs to be folded, kids who need to be driven to the mall, and who is in charge of the remote. It's as if the boat thing never happened. It happens for everyone. Everyone who is married or living together or just going together started off sweet-talking. What do you need? How can I help? I can do that. No problem! Flowers for no reason. Poems. Chicken soup when you're sick. Ice cream just because. Phone calls that are more than traffic reports. It's all sunshine and roses. Until it isn't. That's when it's important to remember the beginning. "He sold his boat for me." This was my beginning. Beverly Beckham can be reached at bevbeckham@aol.com.